I know all of you love Amazon gift card giveaways, so here's another one for you! 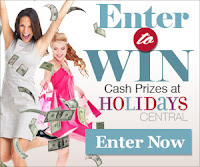 Enter below for a chance to win! Welcome to the Summer Sprout $25 Amazon Gift Card Giveaway hosted by The Parenting Patch and Give It Love! One lucky reader of The Parenting Patch and Give It Love will win one (1) $25 Amazon gift card. To enter for your chance to win the Summer Sprout $25 Amazon Gift Card Giveaway, simply use the following Rafflecopter form. Good luck! The Summer Sprout $25 Amazon Gift Card Giveaway is open to legal residents of the United States of America. 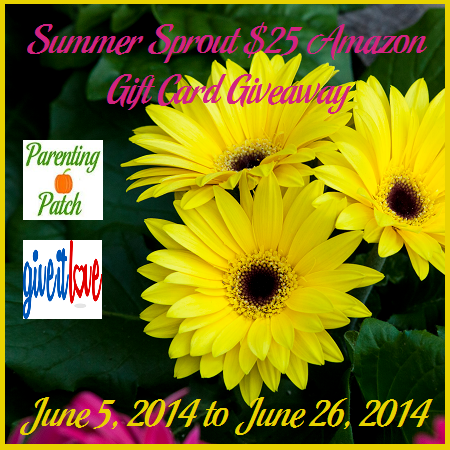 The Summer Sprout $25 Amazon Gift Card Giveaway ends at 11:59 PM CST on June 26, 2014. One winner will be chosen at random via Rafflecopter. The winner will be sent an email and will have forty-eight hours to respond. If no response is received within forty-eight hours, another winner will be chosen. Participating blogs are not responsible for prize fulfillment.